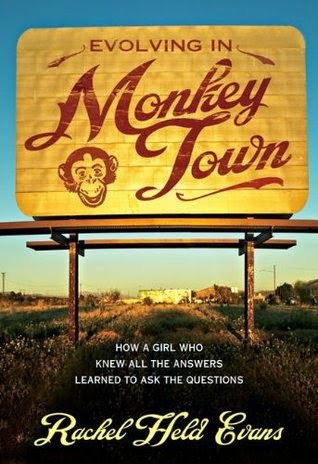 In Evolving in Monkey Town, recently re-released as Faith Unraveled, Rachel Held Evans chronicles her spiritual journey from fundamentalist evangelical Christian to progressive evangelical Christian. Wait – What? Those exist? Yep, they sure do. I've admired several, including Rachel Held Evans, from afar and I've even met several in real life! While I’m sure some of the specifics of our faith differ, Rachel and I share similar views on the application of the gospel, on the necessity for individual journeys and asking questions. We share a confidence that God is bigger than all of us and when we try to hard to insist that we really know the One And Only True Way God Sees Things (which happens to coincide very neatly with the way we see things), we’re more likely than not getting in our own way. Raised in a conservative Christian home, a self-described "Jesus freak", winner of the Best Christian Attitude Award at her private school for four years running, and determined to be "the right kind of Christian", Rachel learned Christian apologetics at a young age and only got better and more effective over time. But then some doubts started to creep in. It occurred to me that in worldview class, we laughed at how transcendentalists so serenely embraced paradox and contradiction, but then when on to theology class and accepted without question that Jesus existed as both fully God and fully man. We criticized radical Islam as a natural outworking of the violent tone of the Qur'an without acknowledging the fact that the God of Israel ordered his people to kill every living thing in Canaan, from the elderly to the newborn...We claimed that ours was a rational, logical faith, when it centered on the God of the universe wrapping himself in flesh to be born in a manger in Bethlehem. Most worrisome, however, was how we criticized relativists for picking and choosing truth, while our own biblical approach required some selectivity of its own. For example, I was taught that the Bible served as a guidebook for Christian dating and marriage, but no one ever suggested that my father had the right to sell me to the highest bidder or to take multiple wives, like Abraham. Homosexuality was preached against incessantly, but little was said of gluttony or greed. We decried the death of each aborted baby as a violation of the sanctity of human life but shrugged off the deaths of Iraqi children as expected collateral damage in a war against evil. What to do with all the contradictions, with all the questions? Rachel describes her state of being at this point as more of a "faith malfunction" than a full blown "faith crisis." And then she sees footage on CNN of the execution of a Muslim woman in Afghanistan for allegedly killing her abusive husband (a confession which had been extracted from her after two days of torture). Zarmina's death shook Rachel to the core, not only because of the injustices heaped on Zarmina during her life, but because "twenty years of Christian education assured me that because Zarmina was a Muslim, she would suffer unending torment in hell for the rest of eternity." She had been taught that only born-again Christians went to heaven, but it just didn't seem right that "hell will be populated not only by people like Hitler and Stalin, Hussein and Milosevic but by the people that they persecuted." What makes a faith crisis so scary is that once you allow yourself to ask one or two questions, more inevitably follow. Before you know it, everything looks suspicious. Doubts I'd been shoving to the back of my mind for years came rushing forward in an avalanche of questions: If God is really good and merciful, then why did he command Joshua to kill every man, woman, and child in Jericho? Wouldn't we call that genocide today? How can God be fair and just if he preordains our eternal destiny, if most people have no choice but to face eternal damnation?...If all truth is God's truth, then why are we so afraid to confront the mountain of scientific evidence in support of evolution? Isn't it a little suspicious that the only true religion is the one with which we happened to grow up? And the questions just kept coming, piling higher and deeper, and no one seemed to have any good answers. Finally, Rachel decided to immerse herself in what the incarnation of God had to say about her questions. As she worked her way through the Gospels, she rediscovered Jesus. "Something about Jesus made me ask better questions. Something about Jesus gave me just enough hope to decide not to give up...at least not yet." Needless to say, that was a strange summer. It wasn't the summer that brought an end to my doubt, but it was the summer I encountered a different Jesus, a Jesus who requires more from me than intellectual assent and emotional allegiance; a Jesus who associated with sinners and infuriated the religious; a Jesus who broke the rules and refused to cast the first stone; a Jesus who gravitated toward sick people and crazy people, homeless people and hopeless people; a Jesus who preferred story to exposition and metaphor to syllogism; a Jesus who answered questions with more questions, and demands for proof with demands for faith; a Jesus who taught his followers to give without expecting anything in return, to love their enemies to the point of death, to live simply and without a lot of stuff, and to say what they mean and mean what they say; a Jesus who healed each person differently and saved each person differently; a Jesus who had no list of beliefs to check off, no doctrinal statement to sign, no surefire way to tell who was 'in' and who was 'out'; a Jesus who loved after being betrayed, healed after being hurt, and forgave while being nailed to a tree; a Jesus who asked his disciples to do the same. Rachel realized that salvation means something different from what she had always thought. "We are not saved by information. We are saved by restored relationship with God, which might look a little different from person to person, culture to culture, time to time." She came to the conclusion that it's not only our ultimate ending point that matters, but that this life is important too. "Perhaps being a Christian isn't about experiencing the kingdom of heaven someday but about experiencing the kingdom of heaven every day." And the single most important factor in being a Christian and following Christ is love: "Taking on the yoke of Jesus is not about signing a doctrinal statement or making an intellectual commitment to a set of propositions. It isn't about being right or getting our facts straight. It is about loving God and loving other people." In a way, we're all fundamentalists. We all have pet theological systems, political positions, and standards of morality that are not essential to the gospel but that we cling to so tightly that we leave fingernail marks on the palms of our hands. But, she continues, "Faith isn't about being right, or settling down, or refusing to change. Faith is a journey, and every generation contributes its own sketches to the map. I've got miles and miles to go on this journey, but I think I can see Jesus up ahead." I could go on quoting large blocks of text from the book, but at this point I just encourage you to pick a copy up for yourself. Rachel's honest and vulnerable account of the changes in her understanding of and approach to God is touching and reverberates across religious lines. Her observations are humorous, poignant, and pointed in turns and are open invitations to all of us to examine our own lives and our own faith journeys as well. If I've learned anything over the past five years, it's that doubt is the mechanism by which faith evolves. It helps us cast off false fundamentals so that we can recover what has been lost or embrace what is new. It is a refining fire, a hot flame that keeps our faith alive and moving and bubbling about, where certainty would only freeze it on the spot. Those who say that having childlike faith means not asking questions haven't met too many children...Questions are a child's way of expressing love and trust. They are a child's way of starting dialogue. They are a child's way of saying, 'I want to have a conversation with you.'" I join with Rachel in a firm belief that God wants to have those conversations with us as much as we do with Him. So we'll keep asking our questions and exploring our doubts and learning more about God as we go.